AllegroMedical.com presents The Cool Mist Impeller Humidifier. Features a patented Impeller disk that prevents mist from spitting out of the unit. 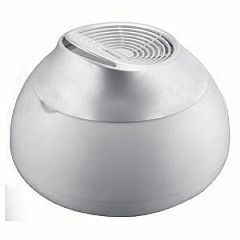 Sleek and compact design that produces a refreshing cool mist that is beneficial for combating cough and cold symptoms. Perfect for small rooms and can run continuously for up to 14 hours per filling. This item has no on/off switch and will run only when plugged in. To turn off, one will need to unplug from a wall outlet. Easy to clean. Effective. Easy To Use. Good Value. Medium noisy but not bad. Daily Use. Small to medium room. We use the product in my toddler's small bedroom almost every night during winter. This unit puts out a fine mist so it doesn't drench everything, but the output is not adjustable. I am willing to have it make a bit more noise than the ultrasonic models because I have found those models don't last more than 9 to 12 months and are designed so you can't clean all the sections effectively. This unit is similar to an old Hankscraft unit I have that throws more water for a larger room. Thanks for giving the consumer options. Appears to go a good job. Effective. Easy To Use. Good Value. Works really well and puts moisture back in the air. Does this unit put a white powder all over the room?